If you’re looking for a jump start into learning about Schroon Lake’s colorful and fabulous past -- and don’t feel like hitting the books -- then consider taking a boat tour to see and hear history come alive. 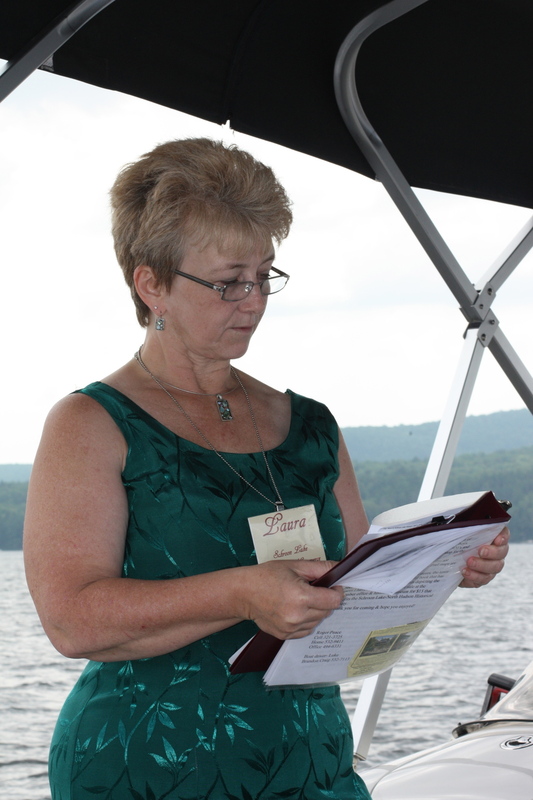 Twice a week the Chamber of Commerce hosts a pontoon boat ride, narrated by the very knowledgeable Laura Donaldson. We recently took a spin with Laura and learned a ton about this once very famous resort town. The tour starts with Laura presenting the two theories of how the lake got its name, before an off shore look see where once grand hotels stood (before mysterious fires) There are some good yarns about some landmarks that are still standing. You get an overall feel for what the mountains are that surround the lake -- handy if you think they all blend into one another -- as well as some good leads on interesting hikes. Laura has great stories and trivia on just about everything Schroon – from the history of the 48 acre Word of Life Island – sold in 1941 for just $25,000, the summer when Schroon Lake went bonkers when Hollywood took over the place to film Marjorie Morningstar and how radio shows were recorded here by Oscar Seagle for broadcast on NBC. While we have our Band jam at the boat house, open mic night at Witherbee’s and a terrific scheule of summer concerts, there was a time in Schroon’s heyday when orchestras played nightly at many resorts, including the Albernorm, which was said to have had a casino. The tour cost $8 in advance and departs at 11am each Tuesday and Thursday from the World Of Life Dock. It’s best to book ahead. And by no means is this your only source of Schroon Lake history. Look for upcoming features on the Schroon Lake North Hudson Historical Society. Got some Schroon Lake trivia to share? – Tell us in comments.